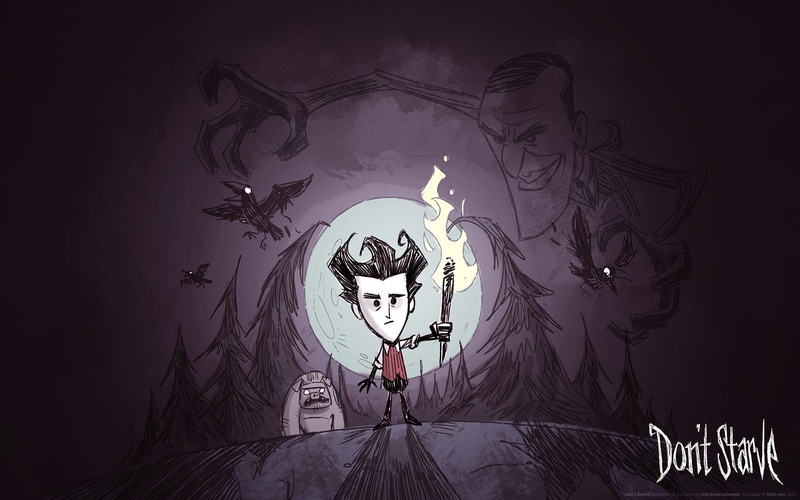 The latest release for PlayStation Plus on the PlayStation 4 is Don't Starve, and interesting survival/horror/crafting hybrid. Think Minecraft with more tension. It is an interesting experiment that does not always hit the mark, but does get quite a few things right along the way. 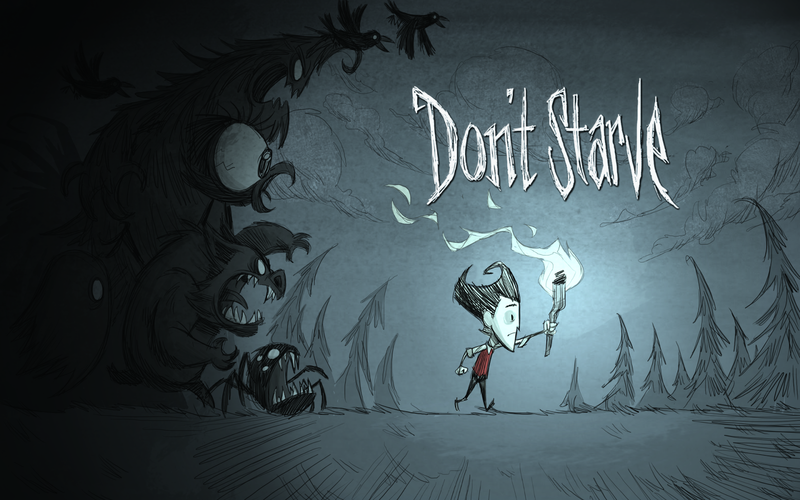 I remember when Don't Starve came out on PC, having seen some of the images and video, but it was not a title that particularly appealed to me. My son spends countless hours with games like Minecraft and Terraria, but I have not played them at any lengthy myself. 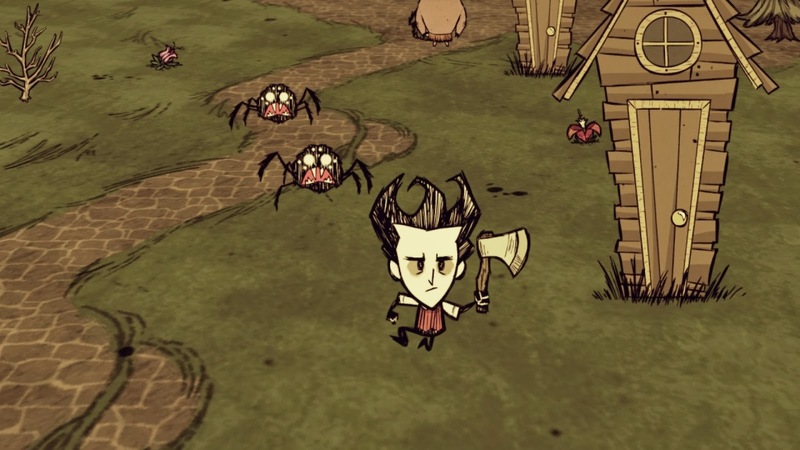 Don't Starve has a very unique visual presentation, with a distinctive art style that looks like it would be right at home in one of Tim Burton's movies (an observation I would love to take credit for, but that my oldest daughter made - who just happens to be a huge Burton/Depp fan). The story is pretty sparse, especially at the beginning. Your protagonist is performing an experiment that failed and gets an offer he should have refused - a demon offering him knowledge, but in the process dropping the character off into the wilderness all by his lonesome. There is no tutorial or hand-holding that takes place at this point. You wander around seeing birds, rabbits, trees, birds, seeds and more. I walked around, picking up everything I found, with no real idea of why. There are three HUD elements to note. In the upper right corner you have a hunger level, hit points and sanity indicator. Not eating often enough can make you so hungry you lose life. Taking damage from creatures can cause you to lose life. Performing different actions such as eating certain foods or killing off certain creatures or using warp holes can cause your insanity to go up. This can present some neat visual effects along the way, and if it becomes too severe then once innocent, safe creatures will even turn on you. 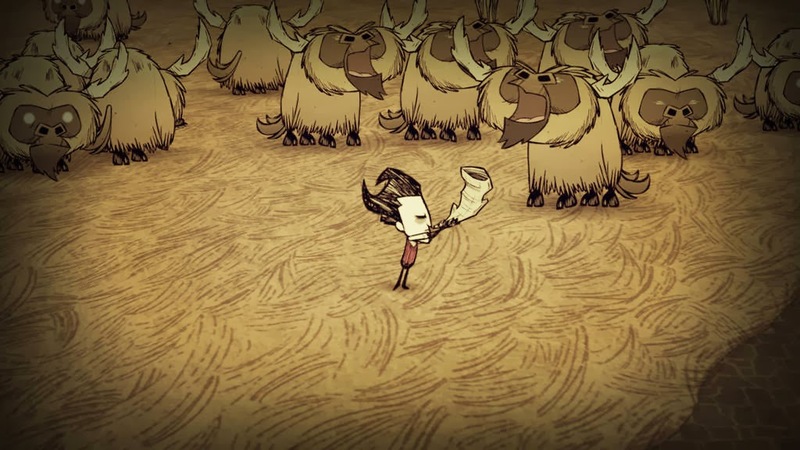 There are a few ways to die, and Don't Starve will expose you to all of them. You also have an inventory bar across the bottom of your screen, and a crafting bar vertically occupying the left side of the screen. Gather enough supplies to make an axe, which will let you chop trees for wood. Grab enough supplies to build a pickaxe so you can mine rocks. Take rocks and wood to a safe location and you can create a fire pit that you keep feeding logs into throughout the night. If you do not have light at night? You get eaten by unseen creatures. You will eventually die, and there are twists along the way that can do you in each and every day. The initial few days are pretty boring once you get used to it, because there is a roguelike element to the game. Once you die - that is it. You are starting over again from the beginning. The only real hint of persistence between sessions is the experience you earn based on how long you survive. Gaining levels allows you to unlock new characters that have slightly different features to them, which does help to change up the gameplay a bit. The overall game's mechanics and structure are decent. 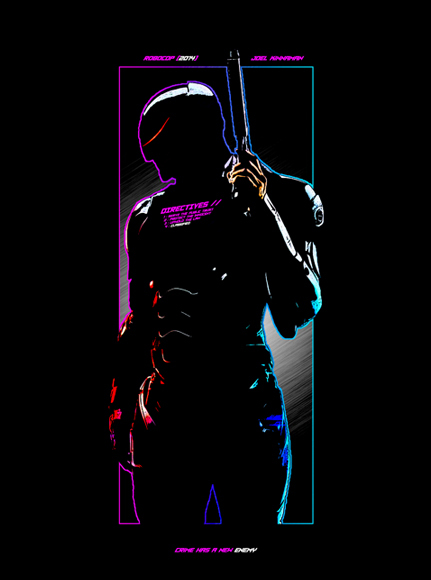 I was not in love with them, and I am someone who really digs that sense of true progression from a game, so the start-over-with-nothing aspect is not my favorite personally. All of this being said, Don't Starve does an excellent job at creating a sense of tension and isolation. You are chucked out into the wild with nothing, and you need to keep your wits about you to avoid getting eaten by the wrong creatures, making sure you have the supplies for a proper shelter and to find enough food to make sure you do not suffer the fate found in the game's title. The first few nights were probably my favorite, in terms of creating a sense of tension. The screen grows dark with nighttime and as you huddle around your fire, cooking food, the fire grows weaker and the darkness closes in on you. You can add pine cones or logs to it to make the radius of the fire's illumination grow again, but the feeling of being completely isolated in a harsh, hostile world is really hammered home at moments like this. 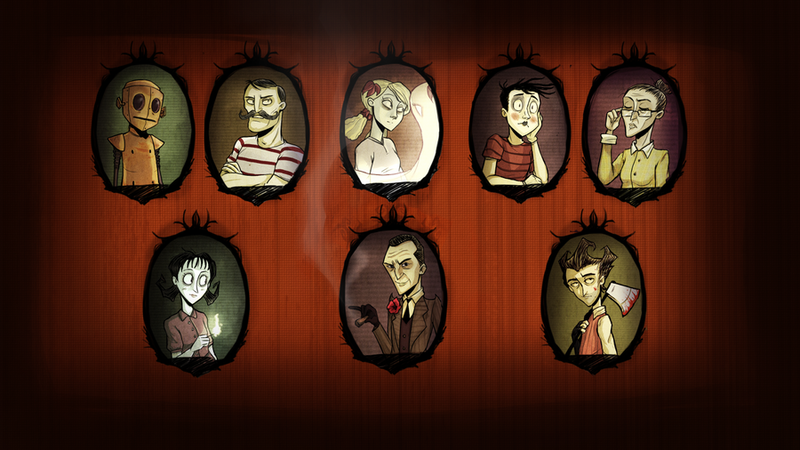 All in all, Don't Starve is an interesting game that does a good job of creating a specific, survival atmosphere. 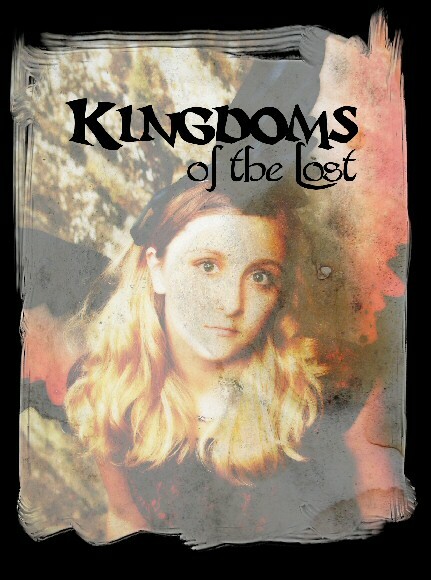 The story is actually pretty interesting - the few bits you get here and there along the way. It is fun for a time, though my incentive to go back and play repeatedly, and inevitably die repeatedly, dwindled a bit faster than I would have liked. 7 out of 10. For whatever reason(s), I never really got into NBA games, outside of the NBA Jam games back in the 90s. During the GameCube/PlayStation 2/Xbox gen, I purchased several NHL games (Hitz and I think a 2K one), and then of course ESPN NFL 2K5 (the best NFL football game EVER!!!!!!!!!!!!!!!!!!!!!!!!!!!!!!!!!!!!!!!!!!!!! ), but never an NBA game. "Apparently the mode is there on PS3 and Xbox One, but it did not make the cut for this new console generation." Shame they cut the one online mode, but it seems a lot of new console launch titles get rushed out the doors. Almost like they wait until the month before the system is releasing, give the old code to some interns, and say..."Make this a launch title!" I still find it bizarre, because it's not like the developers/publishers don't know the new consoles aren't coming for some time. And being that the PS4/Xbox One are supposedly easier to develop for than the PS3/360, it's a bit odd knowing the mode missing. I will say the crowd looks like they have a good variety to them. Kind of curious, but did this one (like all, right?) have a mandatory install before playing? And if so, how many gigs did it take up? Good question on the install size. It was required, and it was a long install, although it allowed me to play a Heat vs Spurs game while it was installing, so that helped the time pass by. It felt like there was some extra love put into the career and association mode for offline, it just felt like online got glossed over, which is a bummer. I am playing more Madden than NBA now, even though I think NBA is the better of the two games.